US Army Cpt. Nick Vogt, his wife Lauren, and their son Nathan. The National Wood Flooring Association (NWFA) has provided flooring for its 31st home in partnership with the Gary Sinise Foundation R.I.S.E. program (Restoring Independence Supporting Empowerment). The R.I.S.E. program builds custom, specially adapted smart homes for severely wounded veterans and first responders. 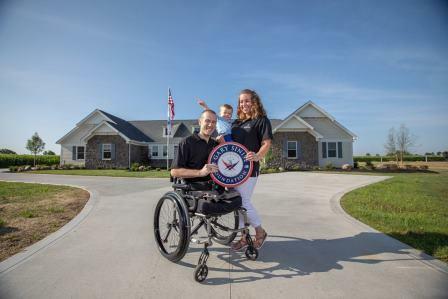 The home dedication for US Army Captain Nick Vogt took place on July 13, in Shelby, Ohio. Flooring for the project was donated by NWFA member Homerwood Hardwood Flooring. Captain Vogt knew at a very young age that he wanted to join the military. He was accepted to West Point in 2006 where he began is formal military training. During his deployment to Afghanistan in 2011, he served as a Platoon Leader. On November 12, 2011, he and his team were on foot patrol when they discovered a weapons cache. While investigating, Captain Vogt stepped on an improvised explosive device (IED), resulting in the loss of both legs, severe brain injury, and a seizure disorder. In addition to the 31 homes already completed, NWFA currently is working with its members to source wood flooring for 19 additional R.I.S.E. homes in various stages of planning and construction. Currently, 55 NWFA member companies have donated product, logistics, and installation services in locations throughout the United States, with a total value of more than $4.0 million. A list of all NWFA R.I.S.E. partners is listed here. By the end of this year, 65 specially adapted smart homes will be completed or underway through the Gary Sinise Foundation R.I.S.E. program. To learn more about the program, and how you and/or your company can get involved, contact the NWFA at 800.422.4556, or e-mail them at anita.howard@nwfa.org.